50 YEARS ON: The end of the A4 Pacifics… NOT! September 5, 2016 celebrates half a century since the final workings of the streamlined A4 Pacifics in BR service. Fred Kerr recalls the last fortnight of their Scottish operations – and notes how the future was not as bad as many feared. As a child in post-war Edinburgh my memories veered between the Caledonian hooters of the Pickersgill 0-4-4T that I heard each night working the Leith North to Princes St services as they passed near my home and the chime whistles of the LNER A4 Pacifics as they passed through Princes Street Gardens, which I frequently visited to see them en route to and from Edinburgh Waverley on their various duties. The fireman of A4 4-6-2 No. 60024 Kingfisher takes a breather at Gleneagles on August 22, 1966 during a stop of the 1.30pm Aberdeen–Glasgow Buchanan St service. My parents moved to England in 1956 and my subsequent awareness of number taking from around 1958 quickly made me conscious that the Haymarket fleet of A4s were considered rarities to local enthusiasts, who quickly became envious of my annual visits to relatives in Edinburgh and the opportunity to sample the rarities on ‘home’ territory. My nearest local English location was at Peterborough and, for various reasons, my visits were few and it was not until the transfer of some of the A4s from King’s Cross depot (34A) to Peterborough’s New England depot (34E) in 1963 that I was able to make better acquaintance with the England-based examples. The rundown of the A4s had begun in December 1962 when Nos. 60003/14/28/30/33 had been condemned on December 29, followed by the 1963 withdrawal of No. 60013 on April 18; No. 60015 on April 21; and No. 60022 Mallard itself on April 25. The 1963 withdrawals followed the official ban on steam operations south of Peterborough from April 22 and the consequent transfer of King’s Cross locomotives to New England. While steam locomotives were officially restricted to services north of Peterborough, the unreliability of diesel traction plus a shortage of Class 47 locomotives saw steam traction continue working south to King’s Cross through the summer 1963 timetable period. At the end of that timetable a traction review saw the A4 fleet transferred to the Scottish Region to work passenger services between Glasgow (Buchanan St) and Aberdeen with Nos. 60006/7/10/16/23/26/34 shared between 61B Aberdeen (Ferryhill) and 65B St Rollox. New England had already withdrawn No. 60008 Dwight D. Eisenhower on July 20 1963 and retained Nos. 60017/21/25/29/32 until their official withdrawal on October 20, 1963. The Gateshead (52A) stud of A4s was similarly affected by the influx of diesel traction and its 1963 changes included the withdrawal of No. 60018 Sparrowhawk on June 19; the transfer of Nos. 60005 and 60019 to the ScR in September 1963; and retention of Nos. 60001/02/ 20 as spare locomotives until their 1964 withdrawal in October, May and March, respectively. were available to work the two steam-hauled diagrams. 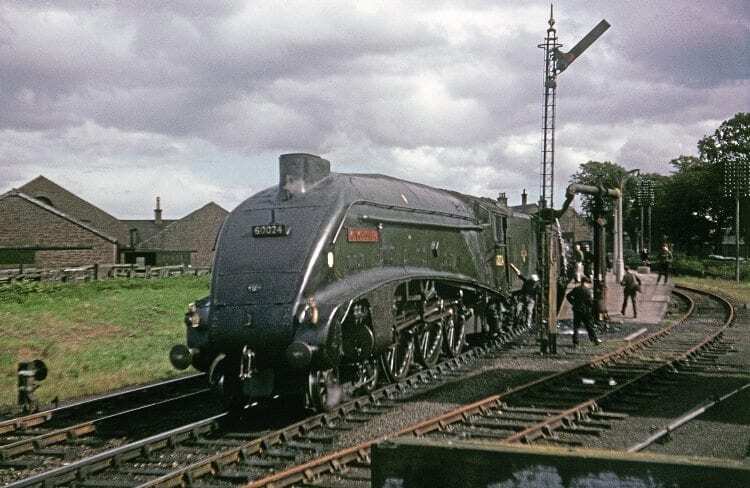 Having already arranged a ScotRail Rover for the final fortnight of the A4 workings, linked to a ‘Farewell Tour’ that would return me home, I looked forward to sampling my last runs behind Gresley’s masterpiece design. A2 4-6-2 No. 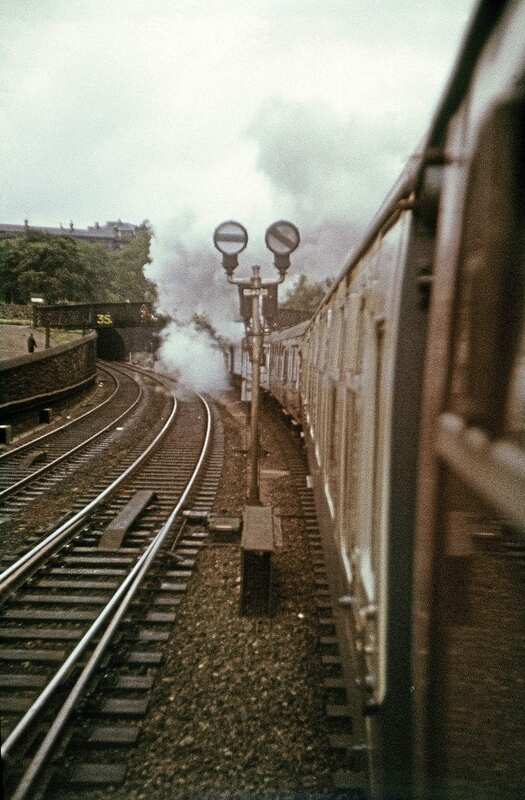 60532 Blue Peter enters Haymarket Tunnel from Princes St Gardens on August 27 1966 working the final 10.30am SO Edinburgh-Aberdeen service of the summer timetable – and the last steam hauled service between the two cities. The final fortnight arrived with only two A4s at work, supported by Peppercorn A2 4-6-2 No. 60532 Blue Peter, with No. 60004 William Whitelaw, No. 60009 Union of South Africa and No. 60034 Lord Faringdon having been withdrawn in July, June and August, respectively. My holiday itinerary had originally been geared to travelling lines such as the Waverley route that were scheduled for closure and noting steam locomotives that were due for withdrawal following the ScR’s decision to finish steam traction by September 3, 1966. The withdrawal of the A4s, as part of that decision, meant a change of plan to include some runs behind the last remaining trio of Pacifics. The most popular run was the 1.30pm Aberdeen-Glasgow service and on Monday, August 22 I travelled from Edinburgh to Glasgow, where I joined an Aberdeen service from Buchanan St. The latter train was hauled by a North British Type 2 diesel locomotive, which provided an interesting comparison with the later steam-hauled run. On passing Perth depot, No. 60034 Lord Farington was noted dumped in the yard and on arrival in Aberdeen I hurried to Ferryhill depot to see the fate of the remainder. On the depot No. 60024 Kingfisher was being prepared for duty; No. 60019 Bittern was undergoing maintenance; and No. 60004 William Whitelaw and No. 60009 Union of South Africa were stored following their recent withdrawal. I returned to the station in time to enjoy the sight of No. 60024 arriving to couple up before entraining to sample lunch on the train and its three-hour run to Glasgow. The service ran over the Caledonian route to Perth, due for closure at the end of the 1966 summer timetable, where a lengthy water stop allowed times for photographs before further spirited running, with stops at Gleneagles, Stirling and Larbert, led to a 5.30pm arrival at Glasgow. If the service ran early, as it occasionally did, it then proved possible to return north behind a second Pacific working the 5.30pm to Aberdeen, but on this occasion the train ran to time and the two services crossed just outside the station. My next opportunity for Pacific haulage came on Saturday, August 27 when the final 10.30am SO Edinburgh-Aberdeen service of the summer timetable was due to run.This was hauled by No. 60532 Blue Peter so I decided to travel as far as Dundee. I had time to visit (ie ‘bunk’) Dundee Tay Bridge shed, where the dump of withdrawn locomotives included another A2 – No. 60530 Sayajirao. I caught a Dundee to Glasgow service, hauled by North British Bo-Bo D6116, to Perth, where I waited for the expected A4 Pacific, which duly arrived in the shape of No. 60024 Kingfisher. The commitment to pursuing ScR steam traction in its last fortnight of operation meant that my next sighting of Pacifics came on Wednesday, August 31 when I visited St Rollox shed to find No. 60019 Bittern awaiting its next duty. The depot was due to be closed at the cessation of the summer timetable hence the friendliness of the staff and their willingness to let me drive No. 60019 around the yard before I had to return to Buchanan St for a northbound run to Perth to connect with the southbound Aberdeen service. The ‘Impossible Dream’ became reality during 2013 when the celebration of the 75th Anniversary of No. 4468 Mallard gaining the world record for steam traction was celebrated by the gathering of all six surviving locomotives, including the pair from Canada and the USA. The final event of the celebration was the gathering at Shildon where, on February 19, 2014, the line-up comprised No. 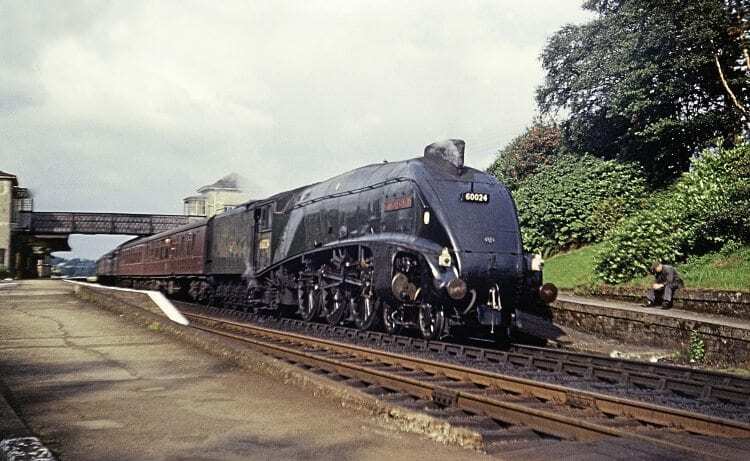 60007 Sir Nigel Gresley, No. 60008 Dwight D. Eisenhower, No. 60009 Union of South Africa, No. 4489 (60010) Dominion of Canada, No. 4464 (60019) Bittern, and the record-holder, No. 4468 (60022) Mallard. This duly arrived behind A2 No. 60532 Blue Peter, which was substituting for No. 60024 Kingfisher, as the latter was being prepared for its finale at the end of the week. The A2 provided an exhilarating run, which was so sufficiently early into Buchanan St I was able to catch the northbound departure with No. 60019 Bittern at its head. This trip was uneventful except that it meant I had had haulage behind all three remaining Pacifics. Domestic arrangements, however, meant that I could only travel as far north as Stirling, where local connections meant an Edinburgh arrival in time for my evening meal. I decided to make my final run from Aberdeen behind an A4 on Friday, September 2 in the knowledge the final run the following day would be accompanied by a traction inspector to ensure no breaches of the ScR’s 75mph speed limit – and such proved to be the case. I was not too disappointed at that as I still had the A4 finale on the Sunday morning – but that was a treat yet to come. In the event No. 60532 Blue Peter was still substituting for Kingfisher and so my final steam-hauled run from Aberdeen was behind a Peppercorn A2 rather than a Gresley A4. My Sunday finale was actually the second day of the two-day ‘Granite City’ railtour to Aberdeen, which had seen Blue Peter working the final leg to Aberdeen on the first day. The second day started from Aberdeen with Kingfisher working to Edinburgh, where it was replaced by Bittern for the next stage to York and subsequent preservation, and where I joined the train for its southbound run as far as Newark. The changeover of locomotives at Edinburgh was speedy, giving only a brief time to photograph the two A4s together in what was thought to be the last opportunity to do so with working locomotives, before No. 60019 departed with an exchange of A4 chime whistles echoing around the cavernous interior of Edinburgh Waverley. The special train sped south with water stops being made at Alnmouth, Newcastle and Ferryhill. The hoped-for high-speed run between Thirsk and York was halted by the lineside hotbox detectors recording a hot tender axlebox just north of York, and Bittern made a delayed arrival into York, where a huge crowd gave a rapturous welcome to the final A4-hauled BR passenger service. No. 60019 was quickly uncoupled and the setting sun glinted off the boiler as it slipped through the station to an uncertain future. The following week was thought to be an anti-climax when both A4s were pressed into service, although officially withdrawn. No. 60019 Bittern was allocated to work a trip duty from York to Healey Mills on Monday, September 5 before returning to York, where ownership was transferred to Geoffrey Drury, with the paperwork reportedly signed in the cab. A4 4-6-2 No. 60024 Kingfisher takes water during a stop at Bridge of Dun on August 22, 1966 while working the 1.30pm Aberdeen-Glasgow Buchanan St service. No. 60024 Kingfisher had a more illustrious exit on Thursday, September 8 when it was used on a Glasgow to Aberdeen service following the failure of the rostered diesel locomotive. But these were thought to be the final acts marking a glorious end to a glorious life. The future for A4 aficionados was not as grim as many thought would be the case in September 1966, with the withdrawal from service of the final pair of A4s, thanks to the efforts of the preservation movement. 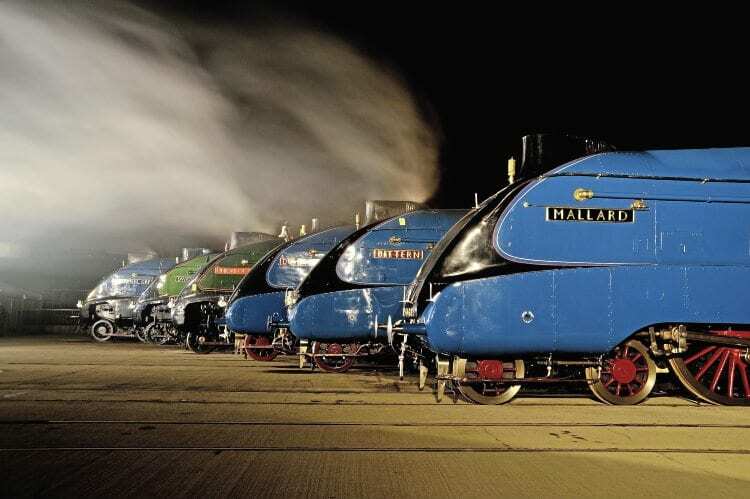 Mallard was always designated to be the star of the National Collection – especially following the move to York in 1975, where it became the centrepiece of the NRM’s display. Less expected was the 50th anniversary celebration in 1988 of the record-breaking run, when the locomotive was returned to active service for a short period of main line running before returning to a sedentary life as a museum exhibit. Despite this lack of live running, however, No. 4468 is occasionally seen at heritage sites other than York, where it still attracts much attention. celebrated the return of main line steam in June 1972 by running a pair of Carlisle to Newcastle railtours before moving to a base at Carnforth in May 1977 for further main line duty. As at 2016 the locomotive is based at the North Yorkshire Moors Railway, although it is currently located in the NRM workshops at York while its 10-year overhaul is undertaken. When released back to its NYMR base the locomotive will work on both main line and NYMR services, thus continuing to display the power and the grace of the A4 design. Once preserved by Geoffrey Drury, No. 60019 had a mixed experience, including storage at the Dinting Railway Centre before being finally restored to active duty at Ropley at the beginning of this century by the Mid Hants Railway. The locomotive is now part of Jeremy Hosking’s fleet, and following seven years of main line service is currently undergoing overhaul at his Crewe base prior to a return to main line duty. LNER A4 Pacific No. 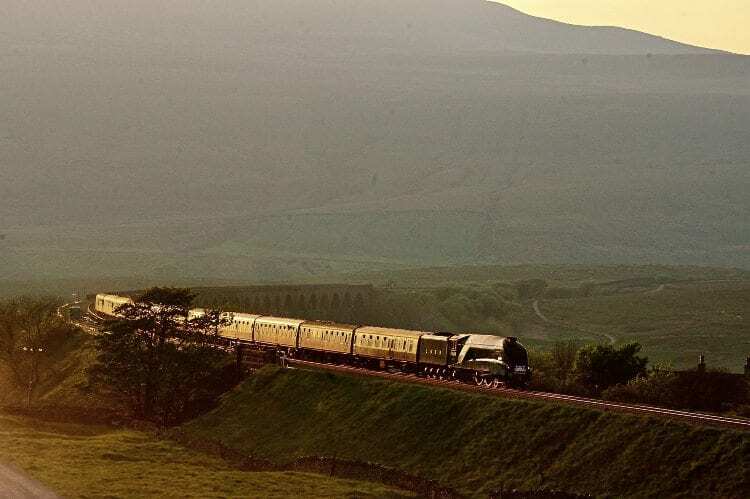 4464 Bittern, curves off Ribblehead Viaduct on May 24, 2012 with the Edinburgh to Long Preston leg of Steam Dreams’ ‘Cathedrals Explorer’ tour. The final preserved locomotive is No. 60009 Union of South Africa, which was bought by Fife farmer John Cameron in 1966 following its withdrawal from Ferryhill depot. Initially bought because it was a Scottish-based locomotive for most of its working life, and the last A4 to receive a full overhaul at Doncaster works, the locomotive has been active since purchase, including the period spent on Mr Cameron’s private line at Lochty, in Fife, during the period when steam was banned from the main line. Since its return to main line duty, No. 60009 has still been considered a Scottish locomotive despite periods based at English sites, including the Severn Valley Railway and Crewe Heritage Centre. It has gained fame through such events as the Centenary of the Forth Bridge in 1990 and the royal opening of the Waverley Route in September 2015, and currently remains in main line service, based at Thornton Junction. The interest in the A4 Pacifics was heightened by the 75th anniversary of the 1938 speed record in 2013 when the event was marked by the amazing sight of all six preserved A4 Pacifics together, including No. 60008 Dwight D. Eisenhower and No. 60010 Dominion of Canada, normally cossetted in USA and Canadian museums, respectively. When the project was initially announced by then NRM head curator Steve Davies few thought it could happen – let alone would happen. Against the odds Mr Davies negotiated the release and return of the duo and saw his actions fully justified by the response as measured by the visitors to the various events held between their arrival in October 2012 and their final display in February 2014. The interest in, and income generated from these events was, in many ways, an indication of the interest that would follow the return to service of Flying Scotsman some three years later, but that is a story yet unfolding. However, returning to the beginning of September 1966, when I watched No. 60019 being detached from the ‘final’ railtour at York, and glinting in the setting sun as it whistled off to an unknown future, who would have dared think that 50 years later three A4s would still be at work in main line service ? Read more Features, News, Views and Opinions in Issue 230 of HR – on sale now! Previous Post:Flour Mill ‘greats’ back in the Forest!